Having you heard of the app "bla bla bla"??? It's great! I've used it not only with kids, but with my Aphasia patients as well to build vocal strength and intensity! I've been using it with one of my kindergarteners to modulate voice, it clicked with him! As much fun as using the ipad is, I also like to back it up with some paper and pencil/crayon work. Oh and some take home too! 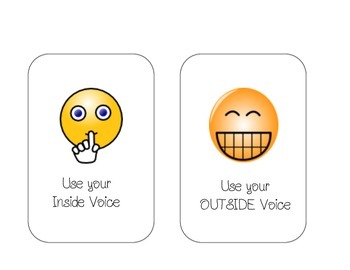 I put together this packet to have him draw what his inside and his outside voice look like, as well as have a visual reminder as to what voice to use! It's definitely been effective, and I can now use the prompt "inside voice" to quiet him down! I've also sent home some of the worksheets as take home so that mom and dad can use this tactic! Download this activity on TpT HERE!